The river in shallows, murmured and chattered. In deep pools, sighing, swishing and swirling. On the delicate touch of the breeze from the river. That day, as we walked in its splendour. We shyly held hands – it was our first meeting. Then, we sat on the grass in quiet conversation. As it flowed past our feet. Both of us nervous of that very first kiss. Or was it a puff from the wind on the river? Eyes open wide and Kingfisher blue. But we drifted apart, then found love once again. True love, mature love, but not with each other. Just as it did when we were so young. I was delighted to receive some recognition for this piece from Oz Poetic Society. 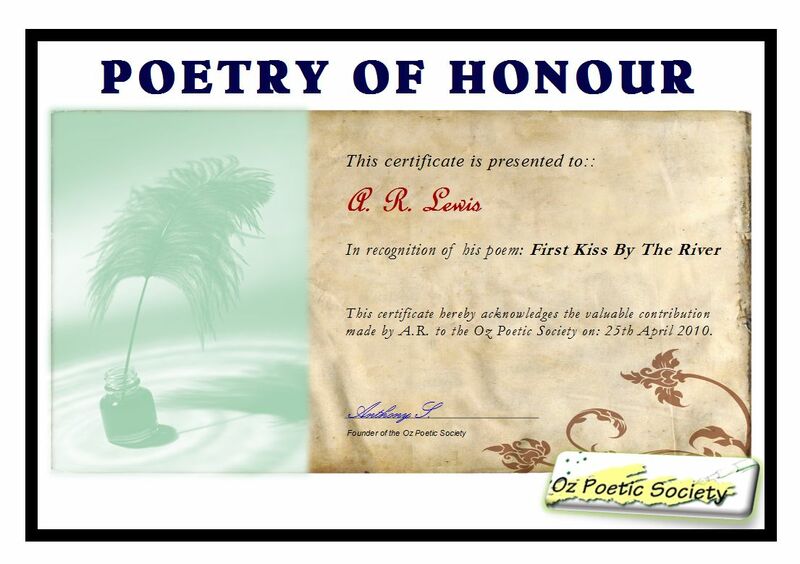 I received a nice little certificate for Poetry Of Honour by email, which was a very pleasant surprise.